The first Vernon Meetinghouse was built in 1763 on a hilltop in what was then North Bolton along the Colonial road from Hartford to Tolland, Stafford Springs and on to Massachusetts. This meetinghouse served the town for 63 years until 1826. The roadway from today's Vernon Center led through Old Meetinghouse Hill Field and up the hill to the meetinghouse. As the town developed and became Vernon in 1808 farms and houses were built along the highway. In 1801 the Hartford and Tolland Turnpike company was chartered to build and maintain the road from East Hartford to Tolland; the main route from Hartford to Boston. Vernon's Milestone in front of the current Vernon Community Art Center erected in 1801 attests to the importance of the road. It may have been at this time the main road was straightened bypassing Meetinghouse Hill. In 1829, 3 years after the meetinghouse was abandoned, the town discontinued the road up the hill and sold the land. 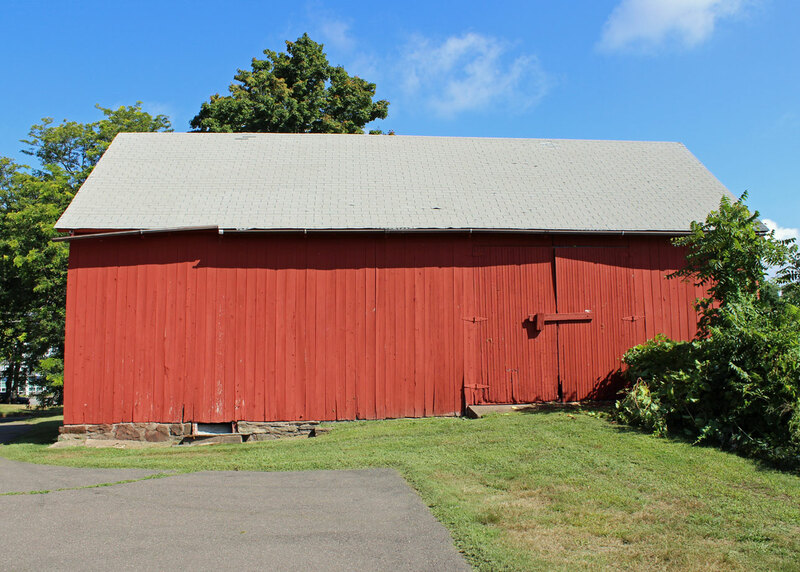 At the bottom of Meetinghouse Hill, at 772 Hartford Turnpike and the beginning of the road up the hill, sits a red barn that is listed on the 'Historic Barns of Connecticut' website. For the past 100+ years it has been part of the Strong Farm as part of their field. The Historic Barn website listing for this barn is minimal, but classifies the typology of the barn as English and New England Hybrid. It says it was constructed circa 1780, 17 years after the meetinghouse was built, making it 235 years old. 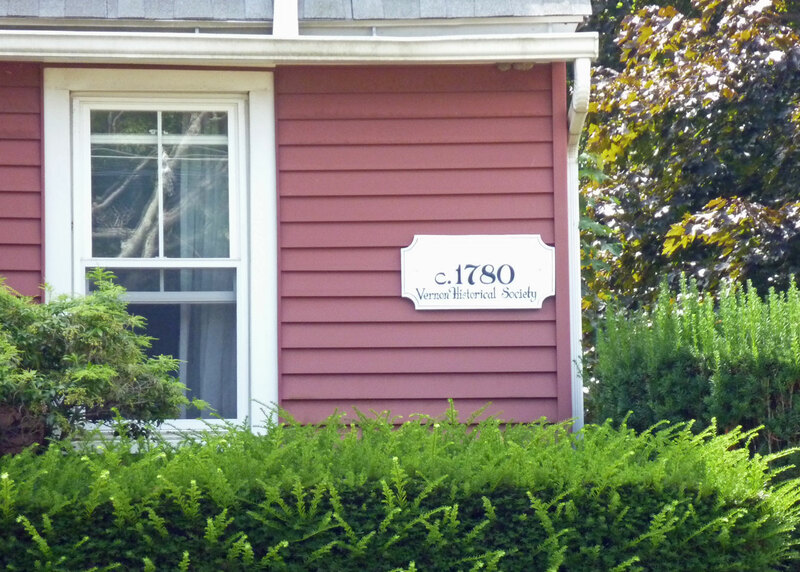 The adjacent house has a Vernon Historical Society plaque also dated circa 1780. Those documenting the barn for the website may have inferred the age of the barn from the age of the house. Note in the aerial photo that unlike the other houses along Hartford Turnpike that parallel the road, both our house and barn are angled to Hartford Turnpike but parallel to the road that would have gone to the Meetinghouse. This offers evidence that the house and barn were constructed before the highway was realigned. Further description says that the materials are cut stone and vertical siding with a gable roof and asphalt shingles. The English barn was the main type used throughout the colonial era in Connecticut. It is characterized by a rectangular plan, a pitched roof, entry through a large door on the long side and a tri-partite plan. Traditionally, hay was stored on one side, animals on the other, with access and grain threshing taking place in the central bay. The New England barn was the successor to the English barn, this type relies on a gable entry allowing for easy expansion by adding bays along the axis of the ridge. Although it was seen by many as an improvement over the earlier side entry English Barn, the New England barn did not replace its predecessor, but rather coexisted with it. The Meetinghouse Hill Barn is rectangular with a pitched roof, entry through a large door on one long side, but is too small for multiple bays. 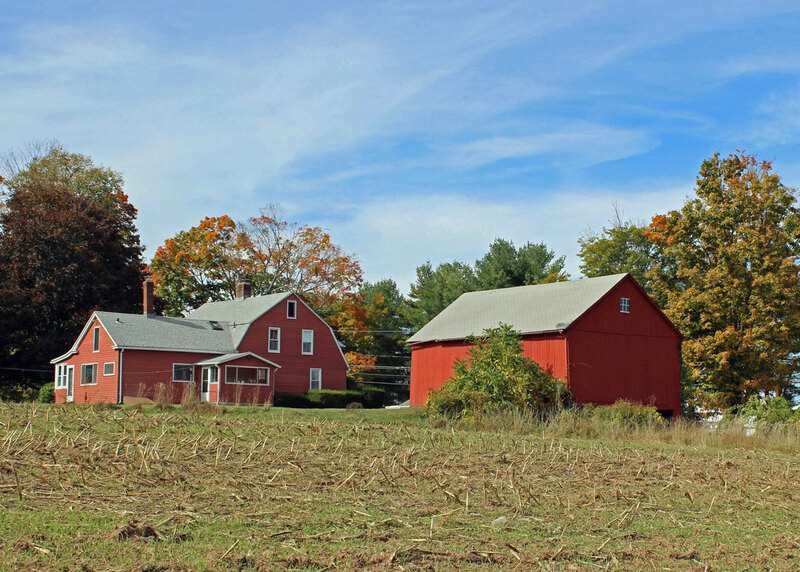 The barn is painted traditional New England red. There is a reason for this choice by early farmers. Originally barns weren't painted at all. The early farmers that settled in New England didn't have much extra money to spend on paint, so most of their barns remained unpainted. 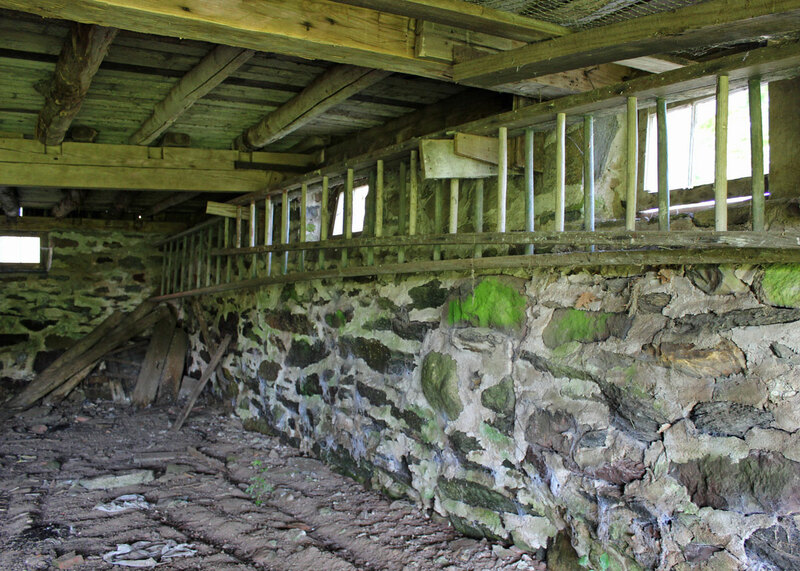 By the late 1700s, farmers looking to shield their barns' wood from the elements began experimenting with ways to make their own protective paint. A recipe consisting of skimmed milk, lime and red iron oxide created a rusty-colored mixture that became popular among farmers because it was cheap to make and lasted for years. Farmers were able to easily obtain iron oxide the compound that lends natural red clay its coppery color from soil. Farmers also noticed that painting their barns with the homemade paint kept the buildings warmer during the wintertime, since the darker color absorbs the sun's rays more than plain, tan wood. So red paint spread in popularity due to its functionality and convenience, becoming an American tradition that continues to this day. Early maps, 1853 and 1857, show property in the area owned by Horace Thompson (on the west) and Elam Pearl (on the east). The 1869 map shows an E. Strong in the Thompson house. Norman Hollister Strong (1857-1911), Norman's grandfather, "bought the 30 acres between Route 30 and Cemetery Road. Bought the barn connected. He refused to buy the house for $500 (red house) – he didn't want it." At this time I don't know the year of the purchase. He writes that the barn was destroyed by the hurricane of September 1938: "The barn on Hartford Turnpike blew in leaving only the two small sides with farm machinery all in a pile. Parts of the roof boards from the barn blew over the road hitting Fred Ecker's barn." The barn was rebuilt after the hurricane. 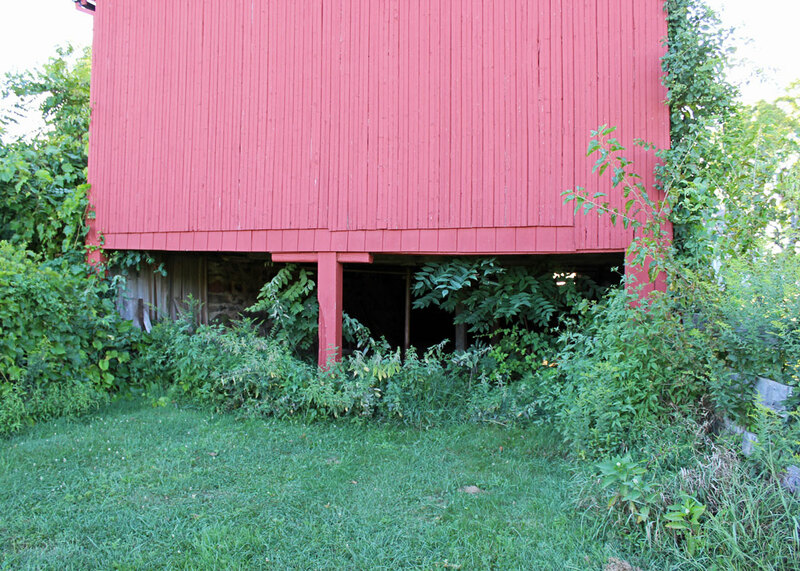 There is no record of how closely the current barn resembled the original, although the foundation is likely the same. No early photographs have come to light thus far, but they may be out there yet to be discovered. 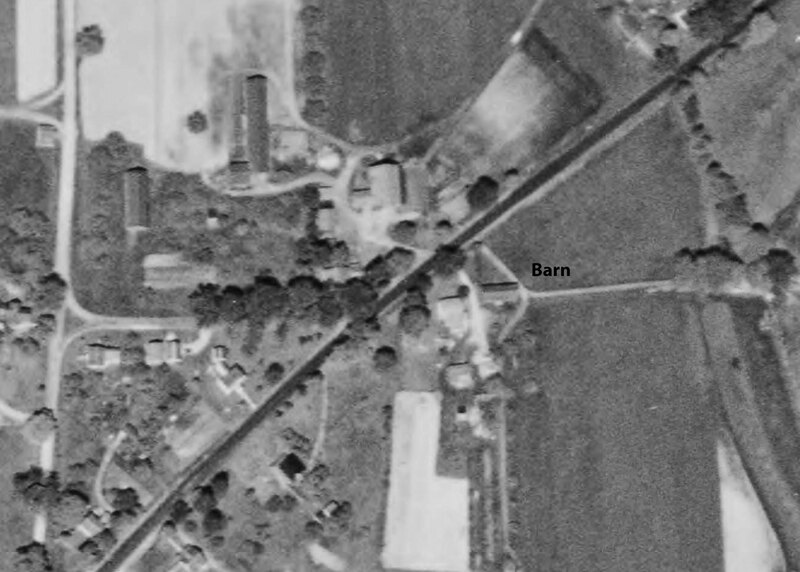 The 1934 pre-hurricane aerial photo appears to be similar to the barn today. 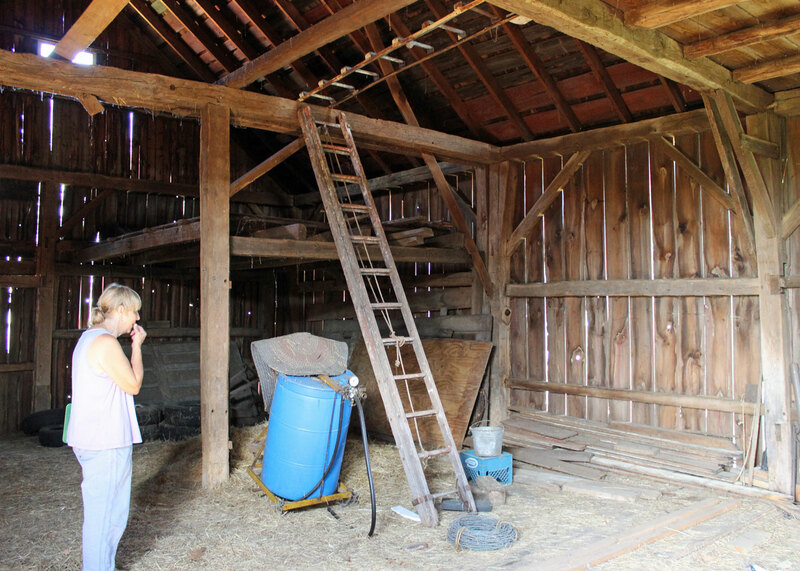 Nancy Strong writes, "The barn was basically used for hay and equipment storage - especially in the winter. I remember at times the downstairs was open for cattle to go into to get out of the elements. Some things are still in there." She says the family believes the barn was built during the Civil War. Today the downstairs is home to nesting barn swallows who swoop in and out continuously. So when the barn was originally built or how many rebuilds there were we can't be sure. Further research in land records may add to our understanding. Last summer Nancy Strong took me through the barn. The photos below are from that visit. Click on each photo to see it full size. North side facing Route 30. South side with double door access. Interior, north wall. Interior, east wall. Note lofts for storage. 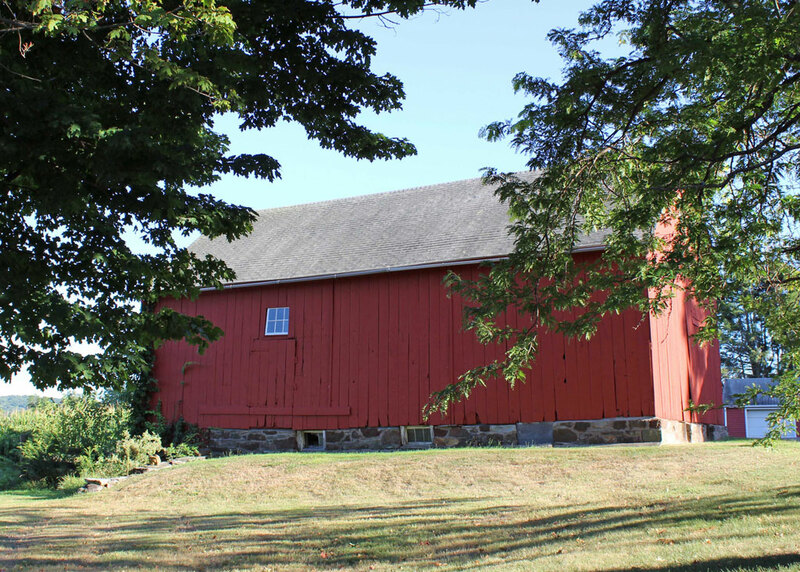 Historic Barns of Connecticut - The Connecticut Trust was awarded a grant from the Connecticut Commission on Culture and Tourism to document significant, historic barns in Connecticut for inclusion on the barns website. Strong, Norman R. (2009). History of the Strong Family and the Farm. Unpublished but available on the Strong Family Farm website. 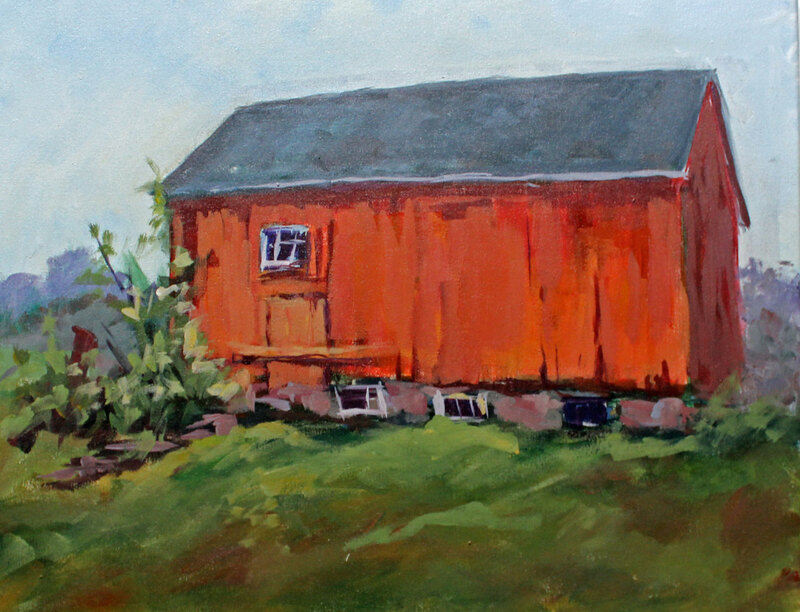 Live Science: Why Are Barns Traditionally Painted Red?